Fiona & Rob first contacted us back in January 2018 when they were recommended to us by their wedding venue, The Priest House Hotel. Following this the couple came to meet us at a local wedding fair where they had a chat with our wedding DJ Jack. The couple discussed their big day plans in more detail with Jack and then we were able to offer ideas to work with their vision. 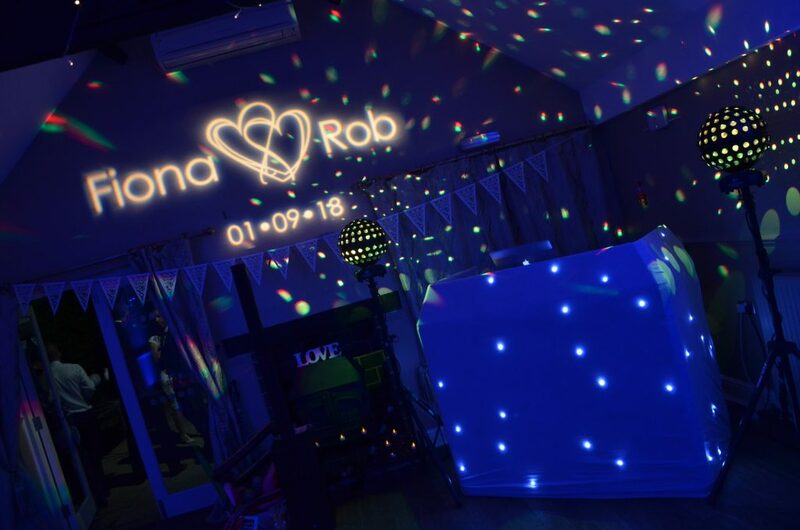 Following the meeting Fiona and Rob decided to go ahead and book our Wedding DJ services, along with a PA system for their wedding breakfast, uplighting and a personalised monogram. Ahead of Fiona & Rob’s wedding I was in contact with the couple to discuss their music requests, first dance, end of the night track, colour of the uplighters and also the personalised monogram. All of the timings were checked with the couple and their venue to ensure that our equipment was in the right place at the right time! With Fiona & Rob’s wedding breakfast taking place upstairs in the Riverside Suite, they hired our PA system so they could plug in their phone for background music during their wedding breakfast. With this we also provided our wireless microphone for the speeches. 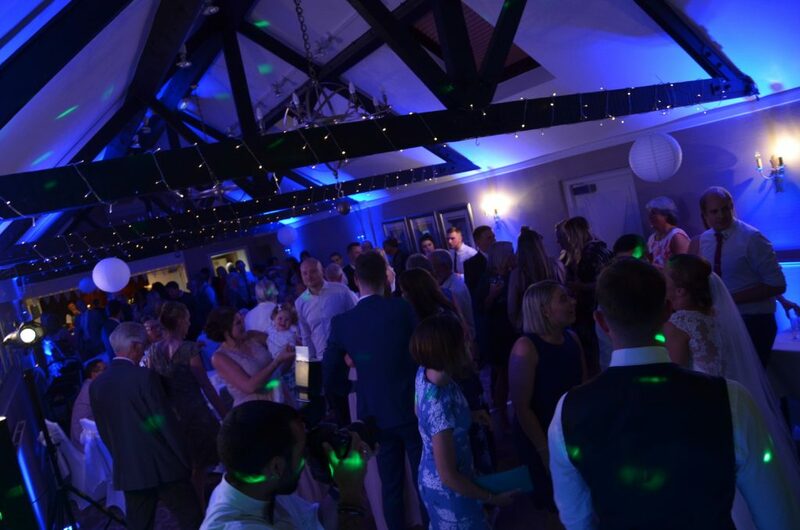 As the wedding breakfast took place upstairs, our wedding DJ Jack set up his equipment downstairs in the Garden Suite where he would be later joined by Fiona, Rob and their guests for the evening reception. As it was a hot summers day Jack set up to the right of the fire place so that the set of doors leading to the patio area could be easily accessed. The uplighters were positioned down both sides of the room in blue to tie in with the couples chosen colour scheme. Finally the couples personalised monogram, with their names and wedding date was positioned above the fireplace for everyone to see, making a personalised feature of this wall on the couples wedding day. 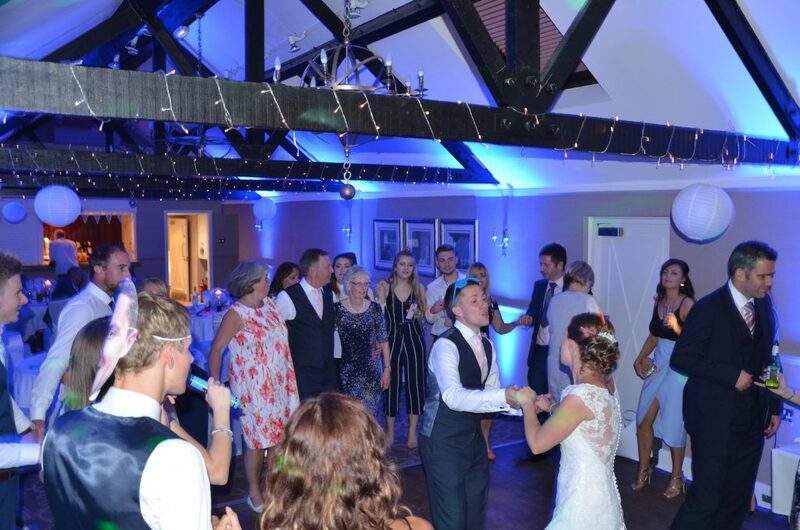 Once the wedding breakfast and speeches finished upstairs, Jack was soon joined by the couple and their guests ready for the cake cutting and first dance. 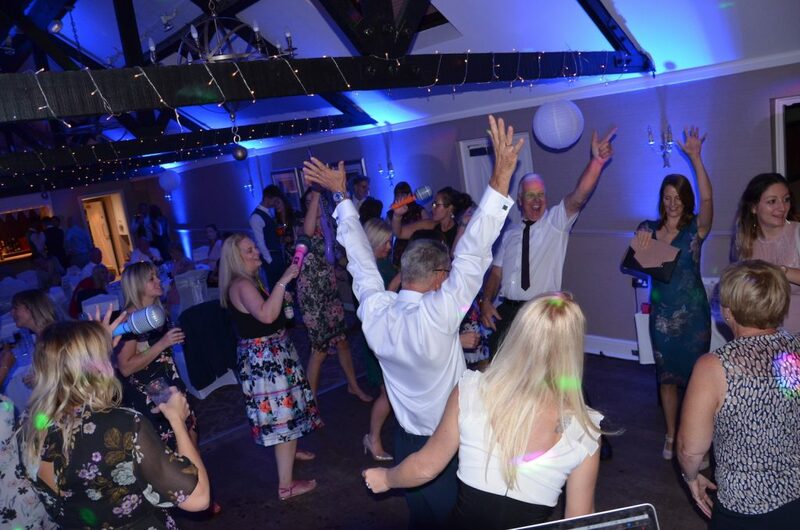 Following this it didn’t take long for our wedding DJ Jack to work his magic and fill the dance floor!